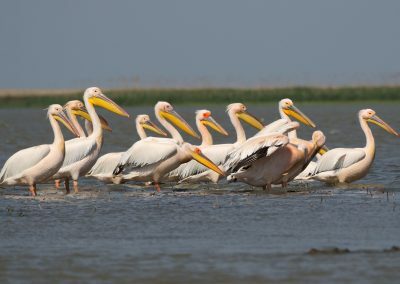 One of the very few holidays to include a week on a floating hotel, exploring the spectacular wildlife of the Romanian Danube Delta. At the end of a 1,700 mile long journey across Europe, the great Danube River empties its water into the Black Sea. Here, the Danube splits into numerous channels and canals, creating the second largest delta on the continent. 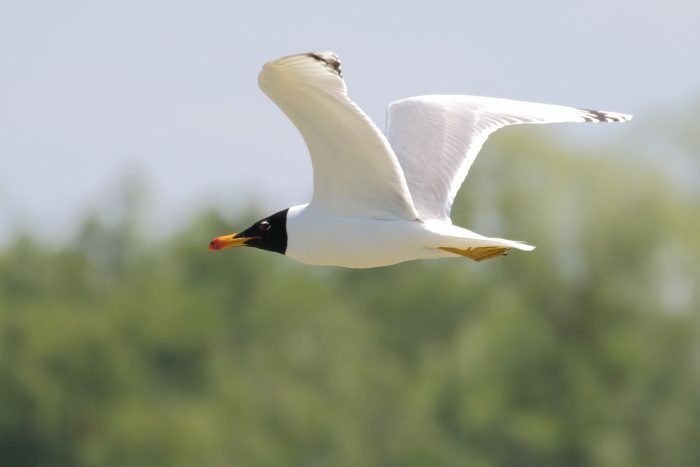 Vast expanses of swamps and forests, as well as a scattering of pretty lakes surrounded by thick reedbeds, provide a perfect sanctuary for over 300 species of bird, many year-round residents, plus summer breeders, and spring and autumn migrants. In the Delta, we stay on a very comfortable ‘travelling’ houseboat, which as well as being equipped with all the ’mod cons’ we might need, also has a lovely open deck for bird-watching and relaxing in the open air. 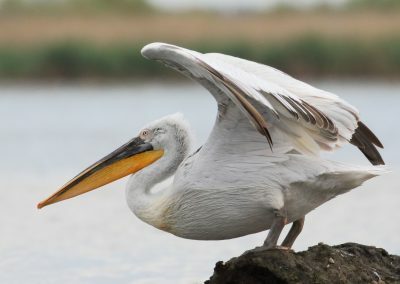 Roller, Black Woodpecker, Bee-eater, Golden Oriole and White-tailed Eagle can all be seen from the houseboat, as well as fly-pasts of pelicans and ibis. Elsewhere, it should be possible to see Paddyfield Warbler and Great Black-headed Gull, as well as huge numbers of herons and terns. As well as enjoying the wildlife, we will learn much about the local conservation projects and how the lives of many of the people of the Delta, many living in remote fishing villages, are an integral part of the wetland ecosystem. Return flights from London Heathrow to Bucharest. Local transport on excursions as specified in the itinerary. Eight nights’ accommodation, full board basis. Day 1 – After arrival in Bucharest we transfer to our hotel in Amara, approximately two hours away. Day 2 – An early morning exploration of the nearby lakes will give us our first introduction to the wetland birdlife of Romania. After breakfast, we travel eastwards, stopping along the way to visit the Babadag Forest and the salt lakes around Murighiol, before joining the houseboat Kingfisher; our home for the next seven nights. Day 3 – We will have a leisurely cruise to Sfantu Gheorghe, one of the most beautiful fishing villages in the Danube Delta. From the deck of the boat we will see many of the typical birds of the delta such as egrets, pelicans, herons, Bee-eater and Roller, and keep our eyes peeled for the beautiful Great Black-headed Gulls, a speciality of the area. 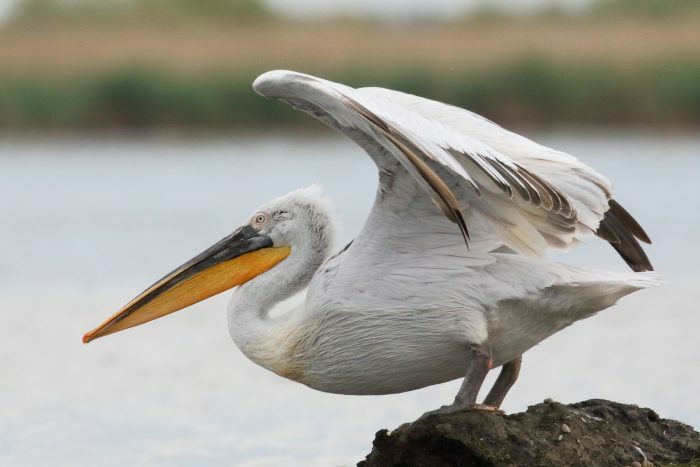 Day 4 – We explore the area around Sfantu Gheorghe by small boat, including the sandy Sahalin Island, an important bird reserve, at the mouth of the Black Sea. After lunch, we will walk around the Sfantu Gheorghe area, where we will look for a variety of migrating waders. Day 5 – After an early morning bird walk around Sfantu Gheorghe, we will have a leisurely day on the boat, travelling towards the Dunavat channel, in the company of Whiskered Terns and egrets, giving us the choice of birding from the upper deck or simply indulging in a siesta! 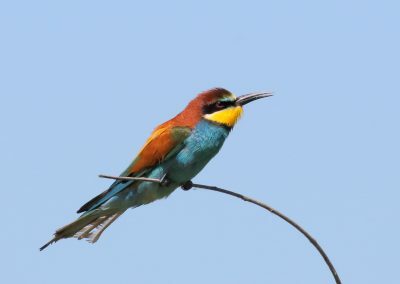 Day 6 – The day will be spent in the remote areas of Zatoane, Perisor and Holbina, along the Black Sea coast, with excellent opportunities for catching up with some of the shyer animals of the Delta; Wild Boar or even Golden Jackal will be looked for, as well as birds such as Paddyfield Warbler and other north-bound migrants. Day 7 – We take a trip to the lakes around the main channel, where the reeds will be alive with the song of birds, including Great Reed, Sedge and Savi’s warblers. Day 8 – Today our explorations may take us to the shallow lagoons hidden amongst the reeds where hundreds of pairs of Whiskered Tern nest amongst the lily pads, and Red-necked Grebes and Red-crested Pochard make their homes. After another birdpacked day, we will relax with a glass (or two) of wine and a farewell dinner on board. 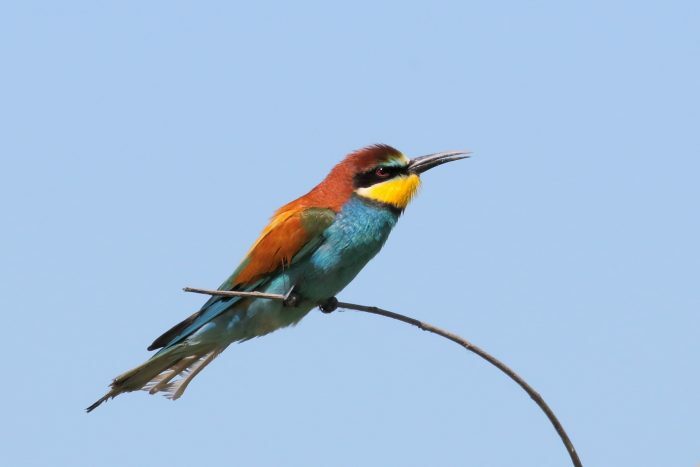 Day 9 – After a leisurely breakfast, we travel slowly back towards Bucharest, stopping along the way for one last spot of birdwatching before our onward journey home. Our first night will be spent in the Hotel Diamant in Amara, half way between Bucharest and the Delta. On the delta, our home is a very comfortable boat, each cabin having an en suite bathroom (shower/w.c). The nine cabins are all on the same deck, outside (i.e. with a window) and have twin or double beds (not bunks). There is an outside viewing deck where we can sit and watch the birds and other wildlife as we drift along the river. Our meals will be a mixture of Romanian and International dishes, with an emphasis on local cuisine. Most of the fresh food is organic and produced locally, including meat and fish. The group flights are with British Airways from London Heathrow. Romania is two hours ahead of UK time. If you hold a British passport, you do not currently need a visa to travel to Romania. If you do not have a UK passport, please check with your local consulate. The weather should be pleasant, mostly warm, even hot, although rain is possible, as is cooler weather. We will not be walking long in the sun. There is no major problem from mosquitoes at this time of year in the delta. None of the itinerary is planned to be strenuous. During this holiday, you will need to be able to climb in and out of small boats, sometimes directly onto the bank. We will spend lengthy periods sat in the small boats, which do not have back supports. Please note that facilities for disabled travellers in Romania are not to the same standard as those provided in the UK. As this tour involves considerable moving around in boats, it may not be suitable for people with limited mobility.